Julio broke into a smile when I told him before the start of my NARS makeover that what I really wanted to try were the Multiples. Oh my god, it's my favorite thing, he gushed, every makeup artist has this in his/her kit. After letting him know that no, I didn't like too much shimmer, he whipped out what he called the trifecta: St. Barts, Maui, and Luxor, and I was relieved. I've known about these things for such a long time, I just hadn't been able to pick out the best colors (for me) out of their impressive lineup. The ones he picked were the ones I've put into online carts but never took the plunge. So with that out of the way, we got right down to business. Luxor - an "iridescent pink"
Maui - a "sheer dusty rose"
St. Barts - a "taupe shimmer"
NARS Multiples ($39) have a pretty unique texture. I know it's a stick of cream, but it doesn't feel like one because it's so lightweight. I should note that I do experience some crumbling if I push them too hard against my skin, but that doesn't impede their performance in any way. Crumbled or not, it's good pigment! The colors are extremely pliable when on the skin. It will literally move anywhere you lead it to, so you can apply the heaviest strip ever on your cheeks and you'll still be able to blend it out. This is potentially dangerous if you have straying fingers. But mistakes can be fixed with a simple swipe of a tissue. The good thing about the Multiples is they could be as sheer or as pigmented as you like. 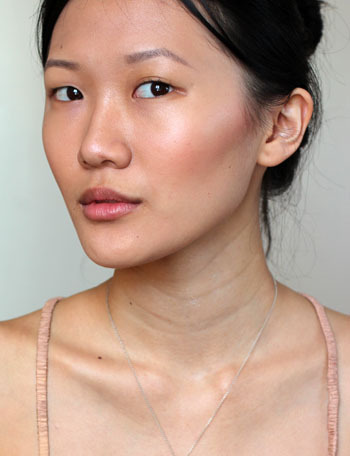 The trick is to build it up in layers, meaning if you want a more obvious look, apply and blend a few layers instead of placing a slab of cream on your cheeks from the get-go. This is because it's difficult to maintain an even intensity if you're dabbing it bit by bit (imagine leveling sand by poking at it finger by finger). You want to drag your fingers through the cream and slide an even layer around your cheeks, then repeat process till satisfied. 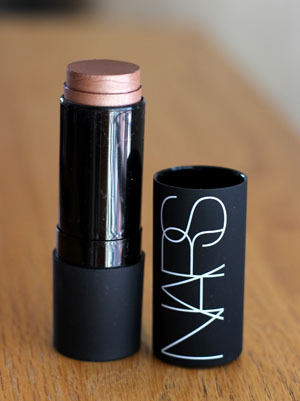 I should let you know that NARS meant these to be "sheer color" sticks. If intensity is what you want, there are millions of better products out there more suited for that purpose. My only beef with the Multiples is I can't call them "long lasting." 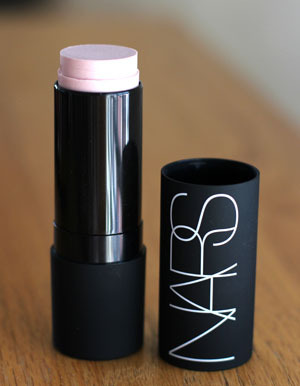 To their defense, NARS never described them that way, but I'm used to my creams being perspiration buffers that cling on against all odds. If I touch my face when the Multiples are on, the color instantly migrates to my fingers. If it's an intense layer of color on my cheek, you will actually be able to see the offending smear. And while I know, I know, I'm not supposed to touch my face... well, who ever eats the vegetables they're supposed to eat? One last thing, NARS Multiples are packaged in smooth, velvety twist-up sticks that pick up fingerprints like your life depends on it. I don't like the idea that these colors could disappear from my face any second of the day, but I do love the teehee I just giggled finish I get from them. I have absolutely no color on my face, so any product that allows me to fake convincing natural flushes will receive a hearty yes, please. Looks beautiful on you! You are gorgeous! Looks gorgeous :) Just a heads up, I find Shiseido's dupe of the multiples longer lasting and they have great colors too! Thank you for reviewing these! Great to see some select colors. St. Barts looks amazing. @Pauline !! Interesting. Shiseido owns NARS so I wonder if they updated the formula. @BelleBelle I'm obsessed about these now :) do you own any? you make me want to buy maui!!! @Lilladylife Maui is really pretty :) It was a toss up between Maui and Portofino for me, but Portofino has a shimmer finish so I went with this. You look just like a model, seriously, you are a beautiful girl. I have three questions. First, how long would you say it lasts? Two what kind of skin type do you have, if you have oilier skin I find it doesn't last as long. And three which cream are you comparing it to, I love cream products and some of them are better than others. Thanks. I thought I was such a Nars girl, but somehow I missed Maui. its gorgeous! Btw, I'm new to your blog (just found it today) and was wondering- are you a model? If not, you sure look like one...flawless skin & bone structure. Those are tricky questions and I'll try my best. I wore it out yesterday when it was 95F/35C and when I got home 5 hours later I could still see a hint of it left, but of course not the way it looked when I first put it on. Keep in mind I'm a chronic face toucher! @ShaGlam Welcome to Messy Wands, I hope you're enjoying yourself. Maui is gorgeous! I'm not a model (though that is truly a flattering comment :D). Thank you for your kind words! I love creams, they can be fun and are really great to play with. I can give you a brief run down of some of the ones that I've used, hmm...it would be a good post idea huh? Maybe in the future. OK, so I've used the Bobbi Brown one and it's good, good pigmentation and it can be layered. I've also used the multiples, and I find that they are lighter, and sheerer. I've also used the multiple in the gel formula and that is also sheer but layers well. I have the MAC cream color (not the blush I've heard good things but I have reservations because when I swatched it looked a bit greasy to me) and use them as a base color for eyes or a highlighter. How I find all of them last the best is by actually layering the colors with a powder formula. That way I get the best of both worlds. It can last all day if you do that. 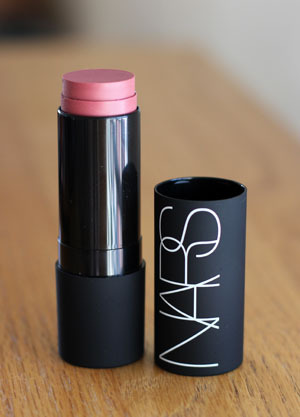 Aww, I was just at a NARS counter! Oh well, there will most likely be a next time. The trio looks so beautifully natural on you; do you think it'd work for different skin tones? I'm fair-skinned and blonde. And "teehee I just giggled"- I love that!